When you’re working with small batches of cement-based products, you might think that all mixers are the same. You know how to use a cement mixer, but do you know how to utilize all the options out there? There are actually several different varieties available depending on what you’re trying to accomplish. In this post, we’ll take a good look at several different types of mixers, in what situations you may need them and how to select the right ones for your needs. Stationary Mixer: A stationary mixer is intended to be used in one place on the job site, which is great if it’s not a large site but still requires a lot of concrete. They’re powerful enough to make a consistent mix and are one of the most common varieties of cement mixer. 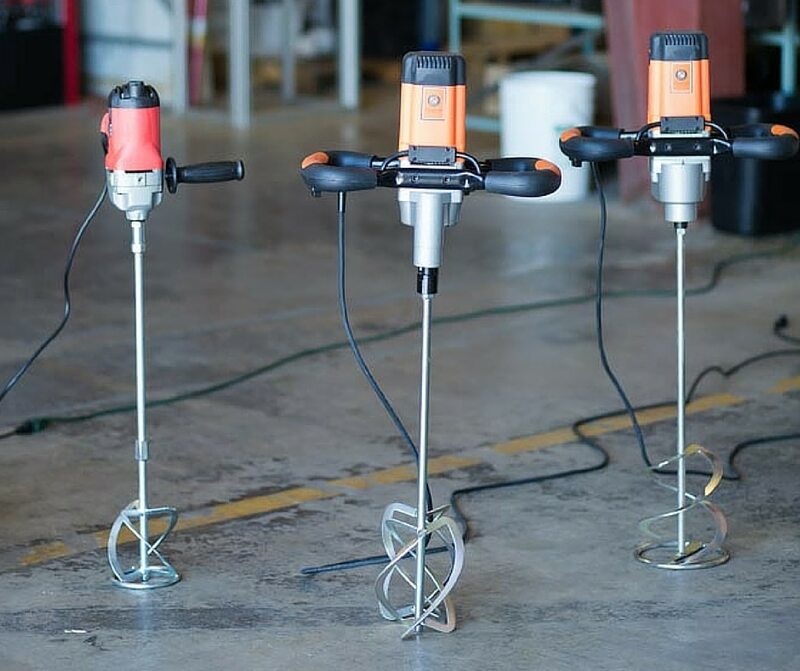 Paddle Mixer: If portability is key and you’re working with small batches of cement, a portable paddle mixer is an awesome choice for your job. Unlike other mixers that rotate a shaft inside a drum or the drum itself, a paddle mixer can use any number of containers and essentially has one or two shafts with spiraling paddles on them that is inserted into the container and started to begin the mixing process. This type of mixer can take care of anything from natural lime plasters to small-batch jobs to advanced DIY work and are a very versatile mixer. Drum Mixer: Another commonly recognized type of mixer, a drum mixer comes in two varieties – reversible, which allows you to reverse the direction of the drum rotation after the mix is complete and the cement mix works it way up and out of the mixer, or tilting, which allows you to tip the mixed contents of the drum into your form. Also referred to as a barrel mixer, the protruding fins that stick out from their attachment points on the interior drum wall stirs the mix until it reaches a uniform consistency. They’re easy to operate, work well for larger quantities and are comparatively speaking low cost and low maintenance. Mobile Mixer: When you see a concrete truck on the road, this is the type of mixer that is being used. Though it can be cost-prohibitive to purchase and requires special licensing for the driver in most cases, mobile mixers can quickly provide a large amount of concrete, often around ten cubic yards or more on a truck. Vertical Axis Mixer: Vertical axis mixers are available in two varieties: pan and planetary. Commonly used in prestressed or precast cement pours, they’re popular due to their small batch size and because they have a high versatility in terms of where the cement mix is discharged once it’s been mixed thoroughly. It’s also able to mix a much more diverse range of aggregates from mortar to heavier cements. Mortar Mixer: Though these mixers look very similar to a drum mixer there are some significant differences such as the stationary drum and moving paddles inside the drum. Because mortar uses much finer material than standard concrete, it needs additional mixing, so the paddles on the inside often have rubber scrapers that ensures the mortar is evenly mixed throughout. As you can see, these different mixer types can create a range of different mixes in different time frames. Some are for very specific purposes while others cover a wider range of construction needs. If you still have questions about the different mixer types or for more information, please contact us. Which Concrete Mixer is Right for Your Project?